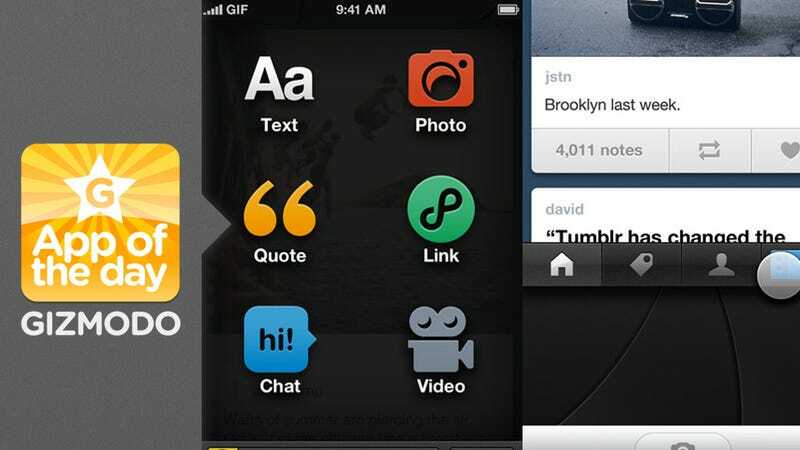 Tumblr has long had an iOS app, and it's was OK. But now it's totally retooled it, adding a bunch of new features focused around making Tumblr easier to use on your mobile device. Long story short, you'll probably be reposting cat GIFs from your iPhone more often. It lets you add stuff to your Tumblr blogs, stay on top of your feed, and search the site. You don't even have to have an internet connection, because it now works in offline mode. The update has also added support for Spotify and high-res photos, made it easier to tap, and introduced search through tags. On top of all that, it's faster and better-looking, since notifications are now all in one place the dashboard. The app is just better all around. And one of the best parts is the addition of embedded Spotify links. On top of that, especially since the iPhone 4S has a 8-megapixel sensor, Tumblr should work with high-res images. And now that it does it's much more beautiful.